The newly built SBR plant of Weikersheim operates four SBR reactors. The control should ensure an energy efficient operation, stabilise the outlet values on a low level and use as little precipitation agents as possible. 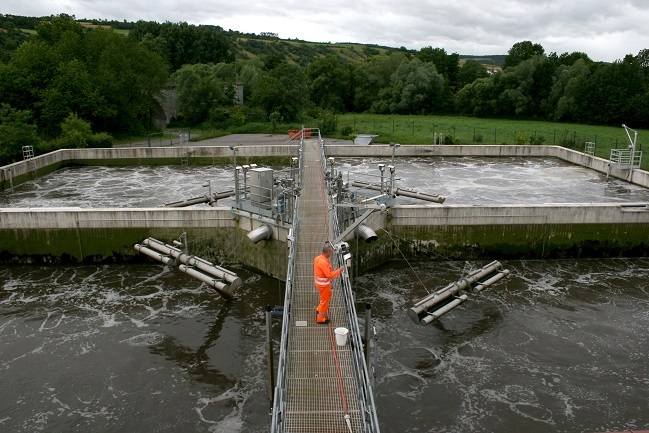 In June 2007 the wastewater treatment plant of Weikersheim was put into operation with the Aqualogic® controller that had been installed by Aqseptence Group. As its input values the controller uses the amount of inflow, the oxygen concentration of every reactor as well as the concentrations of nitrate and ortho-phosphate. To save investment costs the latter are only measured in one of the reactors. Every one of the four reactors is controlled by an Aqualogic® controller to ensure independent operation of the reactors when needed. The relatively inflexible cycles of an SB reactor can be operated load-dependent by using fuzzy logic technology. By varying the cycle time the biological system can be influenced targetedly. Aqualogic® evaluates the start and end point of the aeration phase as well as the duration of anaerobic and anoxic phases load-dependent. This way denitrification and the elimination of phosphate can effectively be optimised. Various algorithms ensure the evaluation of the perfect amount of precipitation agents. When the biological purification is completed Aqualogic® takes care of the required sludge stabilisation. Aqualogic® ensures highly efficient decomposition with low energy use. Passavant® is a well-recognized brand in the field of water and waste water treatment which provides a broad product and solution portfolio for municipal and industrial applications. Such as headworks systems, sludge treatment, filtration and related services.